Crowns, often referred to as caps, are used to repair or replace broken or worn teeth. Crowns are often used in cosmetic dentistry to restore or help improve the look of your teeth. For single crowns, Dr. Fundora uses a non-metal, or porcelain crown using the IPX EMAX crown. Dr. Fundora will discuss your options and recommend a crown that will provide the best possible solution. All porcelain – Dr. Fundora uses the IPX EMAX crown, a unique system for fabricating highly aesthetic and functional dental crowns. It utilizes computer-assisted design/computer-aided machining or “CAD/CAM” technology that provides unsurpassed strength and aesthetics while optimizing fit. Porcelain crowns are usually used in the front of the mouth where your teeth are most visible. Because they do not have a metal base, all-porcelain crowns retain a translucent quality which makes them virtually impossible to detect from your real teeth. The all-ceramic material is extremely biocompatible, being composed of pure titanium and densely-sintered pure aluminum oxide. PFM – Porcelain fused to metal. These crowns are used in molars and in areas that require additional strength for biting. Natural-looking porcelain is bonded to a metal base to form the crown. 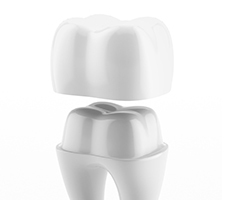 All metal – All metal crowns have been used for many years. In some cases, metal crowns are recommended. The procedure requires two visits. The damaged tooth is ground down to about 25 percent of its original size. An impression is then taken and sent to a lab where the crown is made to fit. A temporary tooth (or teeth) is made until the new crown is completed (about two weeks). During the second visit the crown is bonded to the remaining original tooth. It is then polished, and your smile is restored.